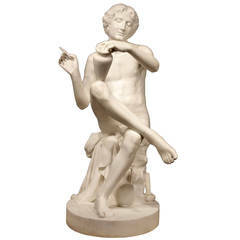 19th Century Fausto Biggi Carrara Marble Sculpture "Summer"
A 19th century marble sculpture by Italian artist Fausto Biggi, in carrara marble. Beautiful figurative sculpture representing a draped woman with a bird on the base. The fingers has been restaured. Signed on the base. Dimensions: Height 77.5cm, width 31 cm approximately, depth 28cm Diameter of the base: 24 cm. Bronze sculpture by French sculptor Barye, representing a lion devouring an antelope, signed. Cast Iron, very good condition. Dimensions: Width 30cm, depth 9cm, height 12cm. Angel kneeling and praying. Very nice face an expression. 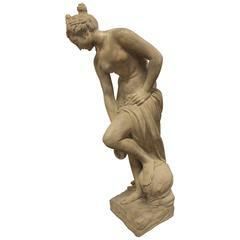 19th century French marble sculpture. The marble is patinated. Antonio Rossetti (1819-1870), 'Amor Secreto' 19th century Carrara marble sculpture signed Antonio Rossetti. Large column or pedestal in Carrara marble with decorative elements and bronze feet, France, end of the 19th century. 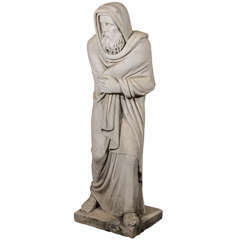 Italian statue of Carrara marble; a figural representation of the season winter, marked INVERNO at its base.